I have enjoyed finding beautiful, creative treats and crafts on Pinterest to make this holiday season. This first one I found months ago and finally made on Christmas Eve. They are so adorable yet so simple to make. They would make a wonderful edible centerpiece as well. Oh, and they go great with hot chocolate too. Make a small hole in the end of your marshmallows. Dip the ragged edge of the candy cane in chocolate. Gently push the candy cane into the marshmallow through the hole. Dip the marshmallow in chocolate, covering as much or as little as you prefer. 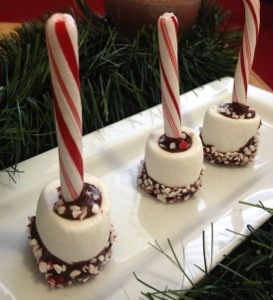 Sprinkle peppermint crunch on the melted chocolate along the marshmallow. The second craft I found on Instagram from Jenny at the Picky Palate. This was so cute that as soon as I saw her photo, I got up and went and immediately made my own. It was such a hit with my niece and made a lovely plate for a cookie photo. Next year I’m making these to place cookies on, wrap up, and pass out as gifts. Line a cookie sheet with parchment paper. 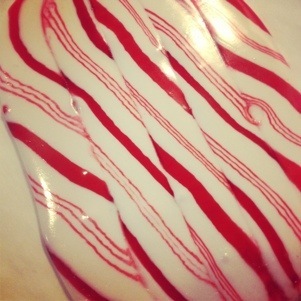 Place unwrapped peppermint sticks (straight or circle ones) on the parchment paper lines up and touching. Bake for 8 minutes. Remove and let cool.